Qatar is one of the most rich monarchies in the Persian Gulf, and an important player on the geopolitical and geo-economic field. Despite the small size of the state, its geostrategic position with enormous economic resources, and channel Al Jazeera as an information resource, turn it into an important opponent of the Continental strategy in the Middle East, especially as an enemy of the emerging Russian-Shiite axis. Qatar is a strategic partner of the US that plays an important role in the US energy strategy in the Middle East. Also it plays a great role in American strategy in deterring Iran and is an American ally in the Persian Gulf. The country’s role in supporting terrorists in Syria, and its backing of Turkey, can make Qatar the next military target of Russia and Iran. The geopolitical position of Qatar as a coastal country in the strategically important Persian Gulf makes it one of the most preferable American allies in the region. Qatar, lying on a peninsula, which juts deeply into the Persian Gulf, occupies an important geostrategic position. Control over a small peninsula allows it to control almost all of the Persian Gulf. There, is situated a large Qatari air base, operated by the United States. Qatar is a former British colony and Atlanticist influence in this country has always been great. Qatari special forces have been trained by NATO countries and its security services have strong ties with its western counterparts. Since the beginning of the 2010s, Qatar has been actively engaged in the modernization, re-equipment and improvement of the combat capability of its armed forces. Its main supporters are the US, France, and Germany. Despite their support of the army of Islamic extremists, the control of which Qatar is struggling primarily with Saudi Arabia, Qatar is seriously concerned about the threats that originate from both the Saudis and their main opponents - the Iranians. In addition, Qatar strives to strengthen its military presence and show its military force and ambitions in other regions, participating in anti-Houthi operations in Yemen, and earlier in the Libyan adventure. Its economy is based in oil and gas extraction. From an economic perspective, Qatar is a primary American ally in its energy strategy. The geo-economic goal is to decrease Europe’s dependence on Russian and Iranian oil and gas supplies. Before the Syrian War, Qatar planned to construct a major gas pipeline to Turkey and Europe, through Syria, but that proposal was rejected by the Syrian government. Syrians preferred the analogous Iranian plan, and this decision was one of the pretexts of the war. Qatar’s TV network Al Jazeera is an important television network in the Middle East, and is indeed an important tool used in information war. During the Arab Spring, Qatar and Turkey backed the forces of the Muslim Brotherhood. Common ideological and geopolitical lines strengthened bilateral ties between the countries. Like Turkey, Qatar is often blamed for being one of the main sponsors of terrorist groups including ISIS and Jabhat-Al-Nusra. Qatar's official state religion is Wahhabi Islam, and through both private and state funds, it provides at least some form of assistance — whether sanctuary, media, money or arms — to the Taliban of Afghanistan, terrorists from Syria and Libya, and allies of the Muslim Brotherhood across the region. Qatar’s role in the backing of terrorism around the world is recognized by its American allies. The United States Treasury officials have singled out both Qatar and Kuwait as “permissive jurisdictions” for terrorist fund-raising. No actions against Qatar are undertaken. While English editions of Al Jazeera have presented flattering portrayals of Western ideas, Arabic Al Jazeera has given sympathetic coverage, bordering on propaganda, to even the most radical Islamist movements across the region. Qatar fully supports Turkey in the current conflict with Russia. This is due to common interests and allied relations between the two countries. Relations between Qatar and Turkey have warmed considerably in the 2000's, and in 2015 was even named by the country, the "Year of Culture of Qatar and Turkey." Qatar supported Turkey during the most controversial actions of the latter. For example in July 2015, when Turkey attacked the Kurds in northern Iraq, these actions were condemned by most of the participants of the Arab League, but not by Qatar. The Ministry of Foreign Affairs of Qatar, said that the country's position is different from the statements of the Arab League. Then Qatar fully supported Turkey, as a close ally, on the issue of air strikes in northern Iraq. Like Turkey, during the Arab Spring, Qatar originally made a bid for the Muslim Brotherhood in the region. Later, both countries maintained virtually the same group of terrorists in Syria. In addition to Syria, one of the fronts on which Qatar and Turkey were directly opposed to Russia, is Egypt. Qatar, through financial support and information war, did everything to usher in the arrival of the Muslim Brotherhood to power in Egypt. The transition of power to a military dictator, Field Marshal el-Sisi, wiped out all their plans for the country. Russia on the other hand, used the change of power in Egypt to forge it into one of its main allies in the region. According to our sources, Qatar helped finance terrorist groups in the Egyptian republic in its confrontation with the secular leadership of Egypt, including those terrorists that were involved in the downing of the Russian passenger plane in the skies over the Sinai Peninsula. Curiously, in Egypt, Turkey and Qatar supported the same force against el-Sisi, while the official Salafist party, which is supported by Saudi Arabia, stayed out of the fray, maintaining neutrality. In March 2015, Qatar and Turkey signed a military agreement which entailed mutual military deployment and the exchange of military training. The agreement also allows Turkey and Qatar the use of each other's ports, airports and airspace. However, the reasons behind this military agreement have not been officially explained, therefore raising suspicions in Turkey over whether Turkish military personnel stationed in Qatar would help train Syrian opposition groups. In fact, in Syria, the interests of both countries are merging, and their goal is the same as the official goal of the entire American coalition - the overthrow of Bashar al-Assad. Their actions led to the achievement of the unofficial American goals – fragmentation of the region and driving it into a state of permanent chaos. Conflict with Turkey over Syria means inevitable conflict with Qatar. Deliberately aggravating relations with Russia, Turkey behaved as if it prepared in advance for this conflict, and enjoys strong support from the outside. Turkey is not only the supporter of the US and NATO, but also Qatar's ally in the Persian Gulf. It is logical to assume that under conditions of an increased likelihood of a military conflict between Russia and Turkey, especially after the Turks have blocked passage for Russian ships from the Black Sea to the Mediterranean, Qatar will take an active part in the military actions on the side of Turkey. This is not unexpected. Earlier in October 2015 Qatar, suggested that it could intervene militarily with the cooperation of Turkey and Saudi Arabia in order to protect Syrian civilians from the Assad regime, as the country's Foreign Minister Khalid Al-Attiyah told CNN in an interview. The suggestion was made after the start of the Russian military campaign in Syria. At that time, Qatar was prepared for a probable military conflict with Russia. Qatar supports the same extremists as Turkey, and is backing Turkey in its confrontation with Russia. In the case of the war, open or not, it will increase its assistance to Turkey and anti-Russian Islamists, not only in the Middle East, and will involve itself more openly in the Syrian War. Russia clearly understands the role of Qatar and so it can become one of its major military targets. Unlike the Turkish case, these actions against Qatar can be supported by Iran, which is Qatar’s main adversary in the region. Indeed they confront each other not only in Yemen and Syria. The very existence of a Wahhabist and US-backed Qatar guarding the Persian Gulf is a threat to Iran’s national security. Qatar and Turkey will make the most of its subversive anti-Russian and anti-Iranian terrorist networks in the Caucasus, in the Volga region, Central Asia, Afghanistan, and South Azerbaijan. 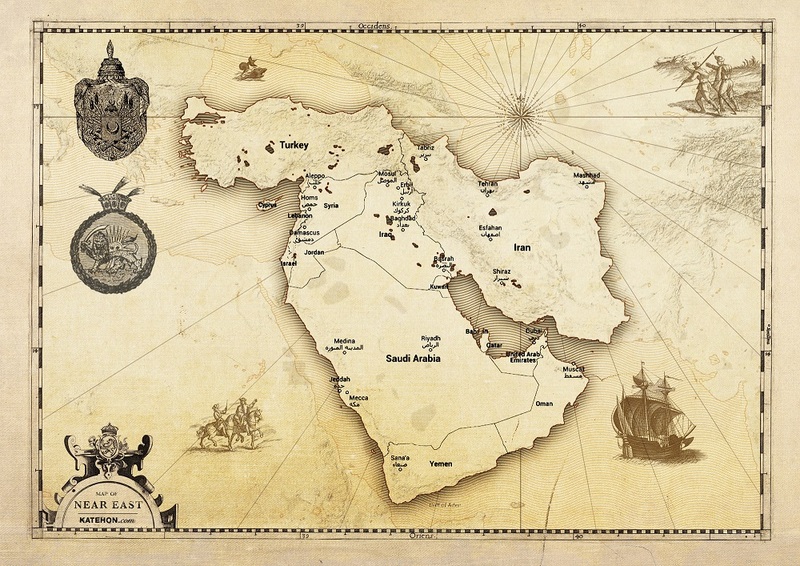 In the need for military means to resist the alliance, is exactly where Turkey and Qatar, and possibly Saudi Arabia, will participate against Russia, and Russia will push for a closer alliance with Iran. Since Iran is not interested in a significant deterioration of relations with Turkey, it will try to use this chance to defeat potential Turkish allies in the Middle East, meanwhile trying to salvage relations with Ankara. However in the case of Qatar, unlike Saudi Arabia, the use of a traditional local Shiite factor is limited because of the numerically small Shiite community in the country.